NASA Earth Observatory image by Joshua Stevens, using data from NASA/GSFC/METI/ERSDAC/JAROS, and U.S./Japan ASTER Science Team. Story by Kathryn Hansen. 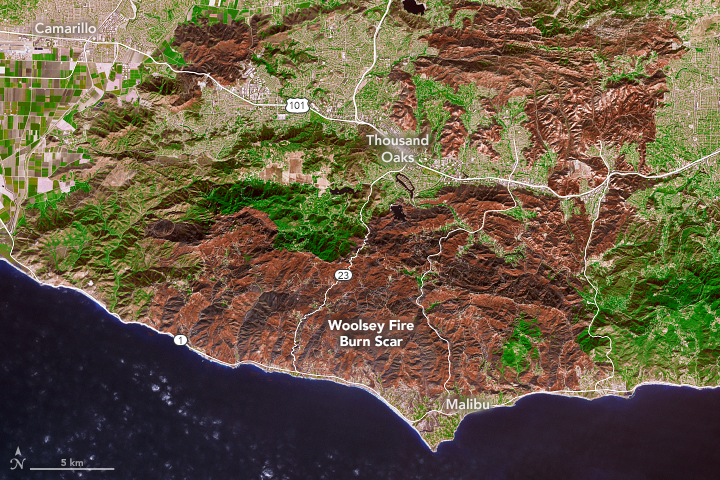 The Woolsey Fire in Southern California has left a scar on the landscape so large that it is easily visible from space. As of November 19, 2018, Cal Fire reported that the fire was 94 percent contained and had burned almost 97,000 acres (393 square kilometers, or 152 square miles). One day earlier, the Advanced Spaceborne Thermal Emission and Reflection Radiometer (ASTER) on NASA’s Terra satellite acquired this view of the burn scar. The colors in this false-color infrared image (bands 3, 2, 1) have been enhanced to simulate a more natural appearance. Burned vegetation appears brown and unburned vegetation appears green. Buildings, roads, and other developed areas appear light gray and white. Other NASA satellite data have contributed to preliminary burn severity maps for this area, which help fire managers plan for recovery across the burned area. Cal Fire (2018, November 19) Woolsey Fire. Accessed November 19, 2018. 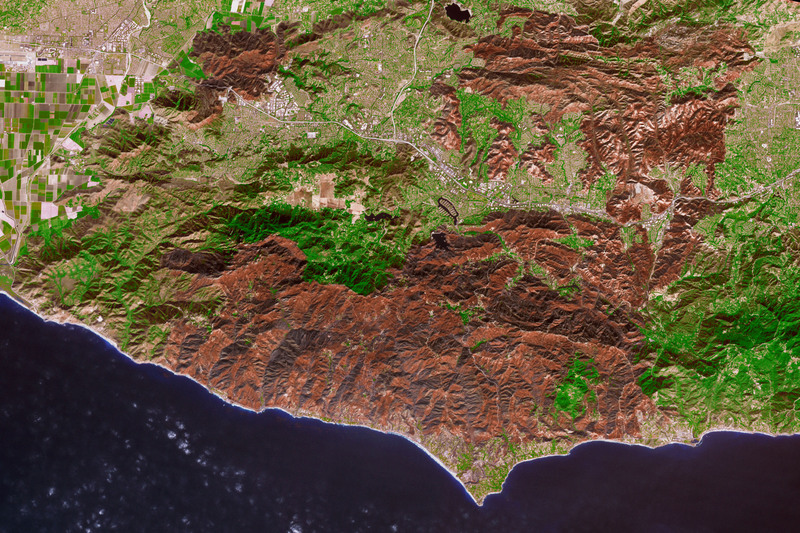 NASA Earth Observatory (2018, November 16) Looking to RECOVER After the Fire.